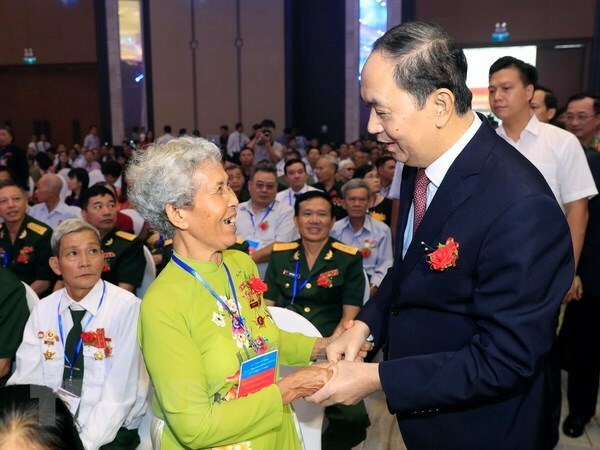 Ba Ria-Vung Tau (VNA) – President Tran Dai Quang has highlighted that the Party, State and society always pay special attention to the caring of war martyrs’ relatives and families of those who rendered service to the national revolution. The President was addressing a conference in Vung Tau city, the southern province of Ba Ria-Vung Tau, on July 19 to honour outstanding people who have made great contribution to the national revolution in 2018, which drew more than 355 delegates from localities across the nation. He stated that along with preferential policies of the State, many campaigns to take care of revolution contributors have been maintained and drawn widespread response. Party Committees, authorities, the Vietnam Fatherland Front chapters at all levels as well as socio-political organisations should be clearly aware that caring for people with contributions to the national revolution is the duty and a regular, long-term task of the entire political system and society, in line with the nation’s fine tradition and the superiority nature of the socialist regime, the President said. He went on to say that the activities also help foster the national solidarity bloc, while strengthening the confidence of people in the Party and State. The leader stressed the need to support disadvantaged families of revolution contributors, with priority given to providing vocational training and creating jobs for them to rise out of poverty. The President affirmed that the great sacrifice and devotion of martyrs, wounded and sick soldiers and their families have always been remembered by the Party, State and people forever.